Back when I first got my order with the Picture Perfect (page 140) stamp set in it, I spent quite some time trying to perfect the look of my hummingbird. Because some of my attempts weren't HORRIBLE, I hung on to them . . . you know, just in case. The first bird I had created that I deemed successful enough to use can be found in this post. Being a four-step stamp, it takes some coordination -- at least, on MY part -- to get the hummingbird components lined up just right. 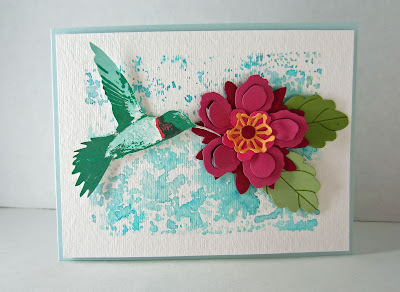 Anyway, a couple days ago, I was groping around for some ideas for a card to use in today's blog post, when, whereupon my wandering eyes should alight, those first hummingbird attempts! This hummingbird, while far from perfect, was good enough to use on a card, but not good enough to be the STAR of the card. 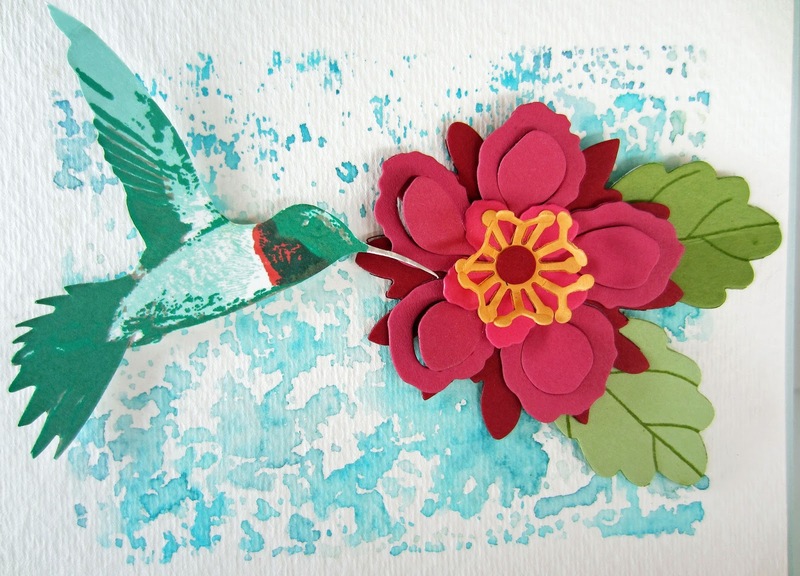 So, even though hummingbirds themselves are rare treats indeed to witness, for this card, I wanted to make the object of his desire -- the flower -- even more of a treat to behold. A truly luscious find. To make his flower especially exquisite, I resorted to using not only the Botanical Blooms stamp set (page 142) for the veins in the leaves, but also TWO sets of Framelits, the Flower Fair Framelits (page 192) as well as the Botanical Builders Framelits (page 194), to create the various components of it. 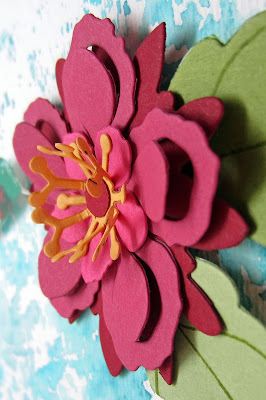 The flower layers are made up of Cherry Cobbler on the bottom, then Rose Red, followed by Melon Mambo. The 1/4" circle in the center of the frittery yellow is a repeat of Cherry Cobbler. The leaves are Old Olive and Pear Pizzazz, both stamped in Old Olive. I bent the leaves along the center vein lines to give them some dimension. Mr. Hummer is made up of Pool Party, Bermuda Bay, Cherry Cobbler and Sahara Sand, then fussy cut and mounted next to his Luscious Find with a couple of Stampin' Dimensionals. 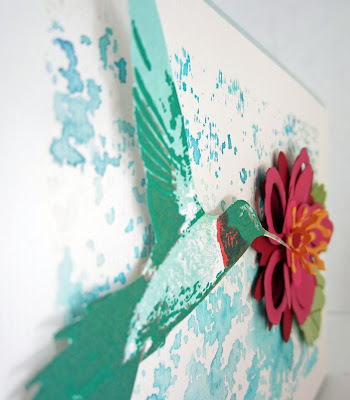 For the background, I scribbled with the brush ends of Tempting Turquoise, Pool Party and Marina Mist Stampin' Write Markers, onto an acrylic block, spritzed it with water, then stamped the block right onto a piece of heavy watercolor paper. Have you ever created something that came together so well and so easily, only to turn out completely delightful? Boy, did I ever need a success like that! 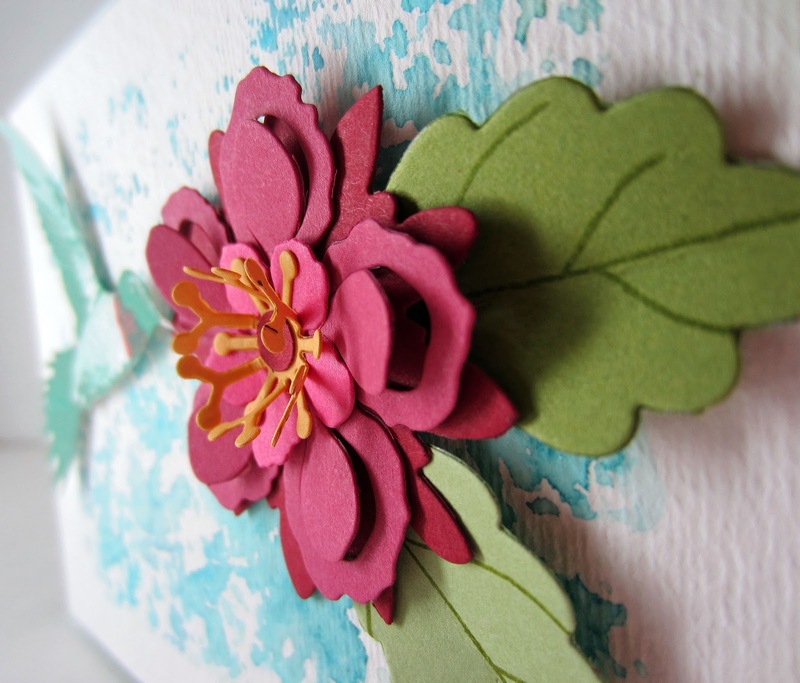 Beautiful card, Linda - and, yes, I love it when things just come together like that! A card that would make a hummer proud!! Beautiful. Thanks for sharing on the Pleasures of the NW’s DIY party-and don’t forget to leave a comment at the party – Next week’s features that also leave a comment get pinned and tweeted! What a beautiful card. Love the flower but your hummingbird is adorable. This is so beautiful! I love how it looks 3d too!! Linda you are very dedicated to your craft and it definitely shows. Your work is beautiful and we always look forward to what you will share at Celebrate Your Story. Thank you so much for joining us each week. Thanks for sharing on DIY-Crush. Linda - I have been enjoying my humming birds all summer and I just love this card it just pops!! It will be a feature!! Thanks for sharing on My 2 Favorite Things on Thursday!! Pinned! Wow, what a lovely card! I'm in awe with your talents! Thanks for sharing at Welcome Home Wednesdays! See you tomorrow! I love how that flower just pops right off the page! So glad you're continuing to join us at #FridayFrivolity!